The Internet of Things (IoT), now presumed to bring about the fourth and biggest industrial revolution, has been an emerging, continually rising, trend for most organizations over the recent years. Corporations from industries all over the world are stepping up their deployments and integrating IoT technologies into their products, processes and workflows. The underlying concept is simple. IoT technologies enable digital systems to communicate and run their dedicated functions almost completely independently. Electronic devices, along with their IoT sensors and assets, are connected to remote servers or cloud. The IoT sensors play key role in the input or detection of data, which is then sent over to the cloud or the remote server for further control and taking relevant actions. The sent data is then analyzed using intelligent algorithms for actionable insights. IoT sensors are the indispensable enablers of the reality of Internet of Things industry. They lie as the backbone to what has brought to life the insane possibility of connecting everything and everyone together. It is making our mechanisms smarter and better, and thus our lifestyles too. In order to be able to exploit the potential of internet of things sensors thoroughly, our industry needs to recognize the underlying challenges that demand systematic attention and address the viability of quality products that then can be put to good use. At TronicsZone, we offer our well-established platform to help enable organizations transform their envisioned product into a trending reality by rendering IoT powered solutions for them. We ensure thorough communication of our clients with our teams in order to facilitate maximum comprehension of what technological aspects they redeem fit and improve their esteemed vision with our experience in the domain accordingly. From incorporating the best fit smart sensors to acquiring accurate insights and platforms, we provide efficient IoT solutions to our clients. The sensors that measure heat energy levels from an object or a source and identify any physical temperature changes from the source. They convert the detected data as digital or analog signals’ output. Temperature sensors can be divided into two main sub-categories. 1. Contact Temperature Sensors – These temperature sensors must be in the state of a physical contact with the source being detected. They use conduction to detect changes in the heat energy. They can be used to monitor any state of matter over a wide range of temperatures. 2. Non-contact Temperature Sensors – These temperature sensors do not require physical contact to monitor temperature. They use the methods of convection and radiation to monitor changes in temperature, instead. They can be used to detect the energy radiated in convection currents or that transmitted from a source as infrared radiation. These basic two types can be further divided into three subcategories Resistive, Electro-mechanical and Electronic; all types discussed below. This is a special type of temperature sensor which infers a thermally sensitive resistor. A thermistor changes its physical resistance according to the temperature changes it is exposed to. They hold the advantage of being used repetitively, providing quick and accurate results each time. Most types of thermistor’s have a Negative Temperature Coefficient of resistance (NTC), i.e. their resistances decrease with an increase in temperatures. Positive Temperature Coefficient (PTC), whose resistances increase with increase in temperatures; these are however relatively less used. Thermistors can be found at varying resistance values from 10’s of Mega-Ohms to very few Ohms. They are categorized according to their time constant, their resistive value at 25 degrees (room temperature) and their power rating, based on the current provided. These resistors/temperature sensors produce a significant voltage output only when current is passed through them, that is, they are resistive devices. Hence, they are generally found connected with a biasing resistor in series in order to form a functioning potential divider network, with the choice of the resistor giving the relevant output of voltage at a predetermined temperature value. Resistor temperature detectors are precision temperature sensors that are manufactured from high-purity conducting metals such as copper, platinum or nickel. Their electrical resistance changes with direct proportion to changes in temperature. Resistive temperature detectors have positive temperature coefficients (PTC). Their popularity lies in their extremely linear results which are efficient and cater accurate temperature changes. However, they incur poor thermal sensitivity. They produce minimal output change with large changes in temperature such as 1 Ohm per degrees Celsius. Resistor temperature detectors require a constant current flow in order to obtain a measurable output voltage that increases with an increase in the temperature value. However, heat produced due to resistance in wires as a result of current flow can lead to erroneous results. This is avoided by connecting the RTD into Wheatstone bridge circuitry which provides extra wires for lead compensation. Typically, resistor temperature detectors have a base resistance of 100 Ω at 0˚C which happens to increase to almost 140Ω at a temperature of 100˚C. Their functioning temperature range resides well between -200˚C to 600˚C. Thermocouples are the most common form of a temperature sensor. They are popular in use mainly due to their feasibly small and compact size, their responsiveness to temperature changes and their ease of use. They also employ a larger temperature spectrum than any other temperature sensor, with their temperatures ranging from below -200˚C to above 2000˚C. Standard color coding is used to cater to this wide range I order to make use of the thermocouple of the right preference. These thermoelectric resistors happen to be implemented on the basis of junctions made out of wires of two different metals welded together. The difference in the temperatures between the two junctions is what sparks up an observable voltage output. The two metallic wires, when crimpled together produce what is known as the thermoelectric effect, which maintains a constant potential difference of a few mV between them. The voltage difference between the two junctions generates a gradient of temperatures between the two ends, also known as the Seebeck Effect. This effect produces the output emf. Inductive Sensors are used to examine metallic items by making use of electromagnetic radiation. They form a substantially robust and high speed detection system. Based on capacitive coupling, this form of technology is capable of detecting anything with a dielectric different from atmospheric air and anything that is conductive. These serve for complicated situations as they are able to sense the tiniest of objects though a large fragment of the inquired source. Ultrasonic sensors are typically suited for harsh conditions whereby their mechanisms portray functioning similar to that of a radar or sonar in order to detect the presence or proximity of its target. Photoelectric Sensors make use of light transmitters to detect the presence, absence and proximity of the targeted object along with a photoelectric receiver. These devices can also sense the amount of light reflected and hence can notify of any changes in the surface of the target object. A device that transmits electrical signals as a function of the pressure changes imposed on fluids. This technology enables industries to exploit testing of various other variables of fluids such as leak testing, altitudes, levels and flow sensing. Pressure sensors developed using piezoelectric materials such as quartz are employed in detecting very high speed changes in fluids. Level sensors are used to determine the amount of fluids and their levels in open or closed systems. These are best suited for a tremendous amount of industries and cases such as sea-level monitoring, industrial compressors, medical equipments, fuel gauging, hydraulic and water reservoirs and so on. It enables these industries to monitor the amount of production within profitable yet safety limits. Point level sensors are used to monitor whether a target fluid is above or below a standard level, and notify accordingly. Their binary output can be integrated into process control systems. These sensors provide fluid level over a range instead of binary outputs. This system is best suited for challenging fluids such as ultra-pure, dirty, scaling and corrosive fluids. A motion detector is an electronic device that uses the motion of its target objects to produce electrical output. Hence their primary role in the security industry in the form of intrusion detection systems, automated window and door control systems, automated parking systems etc. Their use extends to other industries as well such as their use in communication systems. These detect heat energy from objects in the form of infra-red radiation. These emit ultrasonic waves and generate signals based off of the reflected sound waves. Although expensive, these are used to detect motion by emitting radio waves and generating signals as a function of the reflected waves. Accelerometers are powerful transducers that produce electrical output based on the static/dynamic acceleration of an object in its instantaneous frame, caused as a result of force of inertia. Their general mechanism includes detection of vibrations, tilting and acceleration. They can also be used as an alternative for motion sensors in specific cases. Hall-effect accelerometers use Hall’s principle to measure the acceleration of an object in the form of an emf output that results from changes detected in the provided magnetic fields. Based on the Piezoelectric effect, this type of accelerometers make use of the embedded piezo-film to diagnose shock, pressure and vibrations in a given system. These sensors are also referred to as vibration sensors. They comprise of oscillators that diagnose any static/dynamic acceleration on a surface which connected to the circuitry generates an emf value. IR sensors are able to detect multiple attributes, including the amount of residual heat energy, of their target objects based on the emitted infra-red radiation that these objects reflect. A tremendous amount of IoT solutions entail IR detection functionality; from medical enterprises in the fields of breath analysis, blood pressure analysis, optical examinations to numerous smart home enterprises and security management industries. RH sensors, usually used with temperature sensors, detect both moisture in the air and the temperature. They then compare the ratio of moisture in the air at the detected temperature to the highest ratio of moisture that is acceptable for the detected temperature and thus notify if the values exceed limits below and above. 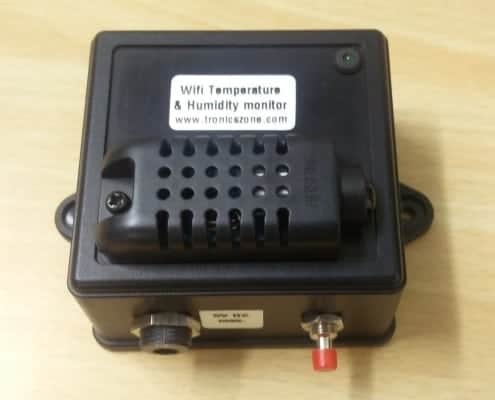 They are popular for their sensitivity and quick response to changes in moisture and thus help safely monitor and provide perfect environment for manufacturing industrial processes as well for control of temperature wherever relevant. Some other forms of IoT sensors that TronicsZone boasts work experience in are Optical sensors, Chemical Sensors, Imaging sensors as well as Gas Sensors. We offer numerous ready-made and near-ready solutions based on technologies in this domain. 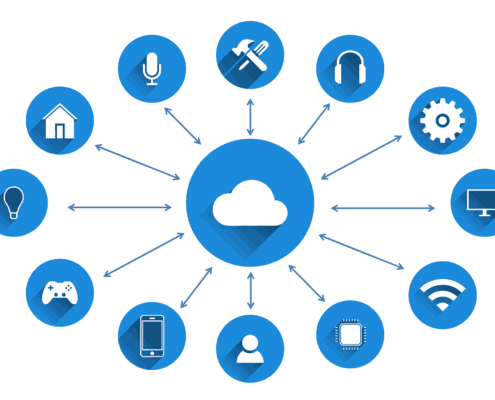 We also work with partners who can provide the IoT cloud software & app platforms which can be altered to our customer’s esteemed vision and preferences.